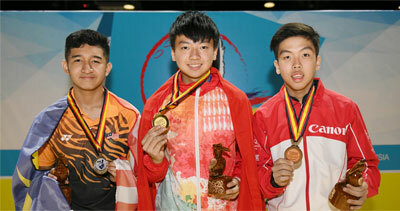 13th November, Kuching: Ivan Tse of Hong Kong A captured the Boy's Singles gold medal at the 18th Asian School Tenpin Bowling Championships with Ahmad Azriq of Malaysia A and Aidan Poh of Singapore A earning the silver and bronze medals. Tse, who won a gold and two silver medals at the 17th Asian School in April this year, set a blistering pace with 255 in his opening game to lead compatriot, Nixon Chan of Hong Kong B by 11 pins. Ahmad was third with 243 as 2017 Asian Youth two silver medallist, Paolo M. Hernandez of Indonesia in fourth. The Hong Kong national added a stunning 277 to extend his lead to 67 pins as Joseph Hing of Singapore B moved up to second with 253 after his 212 opener. Ahmad and Joseph Botham of Australia B stayed close in third and fourth positions. 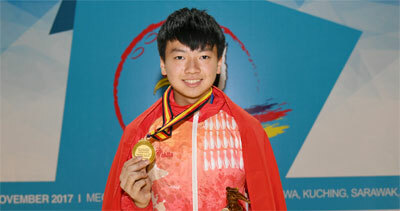 With another splendid 257 in the third game, Tse stretched his lead even further to 120 pins. Botham moved into second while Ahmad remained in third and a second Australian, Joshua Morris making good progress. Tse went on to end the event with 213, 201 and 202 leading from start to finish to win Hong Kong A's first gold medal with 1405. Ahmad's 278 in the fifth and 204 in the sixth game gave the Malaysian the silver medal with 1372. Poh picked up the bronze medal with 1332. Hing missed the podium by six pins despite ending with a strong 246 in his final game. The two Aussies could only take fifth and sixth positions with 1324 and 1306 respectively. Competition will resume with the Doubles event with the boys taking to the lanes at Megalanes Sarawak in the morning and the girls in the afternoon. Medal ceremony for the Singles will be held between the two squads.